【 A Pachyderm with a Punch 】　With 200mm thick armor at its more well-protected areas and a powerful long-barreled 88mm main gun, the Ferdinand made its battlefield debut at Kursk. After the battle, the lessons that were learned were applied in the form of some design improvements, including a hull machine gun, and the modified tank destroyers were officially named "Elefant" in February 1944. Elefants fought on both the Italian and Russian fronts, where their thick armor and heavy firepower proved effective against Allied tanks. The Elefants of s.Pz.Abt.653 in particular took part in operations near Nettuno in central Italy. 【 About the Model 】　★Length: 233mm ★Gun compartment mounted on a modified Tiger tank chassis accurately reproduced. ★Die-cast weights installed inside the chassis offers an added sense of volume. ★Dark Yellow and Dark Green camouflage pattern used on the Italian front expertly pre-painted. 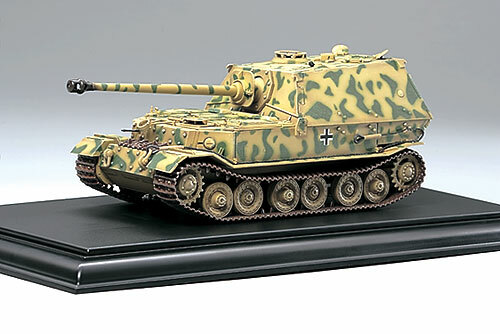 ★Model also features realistic weathering effects for a more eye-catching display. ★High-quality display base included.